Val and I are beer lovers, but I realized we haven’t really focused too much on our love of the brew. Maybe it’s because Val and I met at Penn State University that we love good beer, or maybe its because all our friends love good beer, or maybe its just because good beer is awesome. Whatever the reason, we drink a lot of beer, whether at home or at our favorite DC joints. 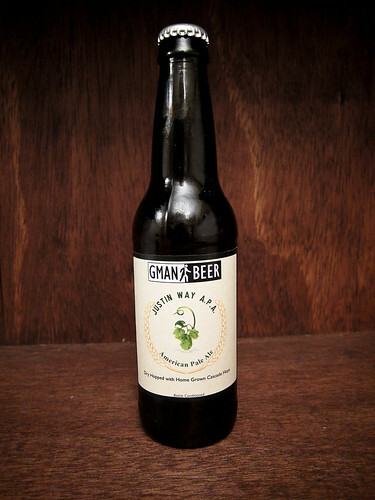 And one of our favorite sources of beer is our friend Matt, who home brews GMan Beer. Matt’s beer brewing career started a few years ago while making a batch of Dunkelweizen – a dark wheat beer – at Shenandoah Brewing Company in Alexandria, VA, for my then upcoming wedding. Next thing I knew, Val and I were at Matt’s one snowy Sunday afternoon helping to brew a batch in Matt’s kitchen using his newly acquired home brewing supplies. Since then, Matt has gone on to brew dozens of batches, join a local home brew club, and built a homemade kegerator. Oh, and he always has a few beers on tap. Anyway, last summer, as I was planting our garden, I jokingly asked Matt if he wanted to grow some hops. Next thing I knew, we had a hop rhymezone in our garden. After a few months, and a few 10′ poles, we had fast growing hop vines everywhere, producing lots of hop cones. Matt came over a few times a week to harvest ripe hop cones, drying them at home, and saving them for a batch of beer. And thus, Justin Way (our street) American Pale Ale was born, with hops grown right here in Silver Spring, MD. 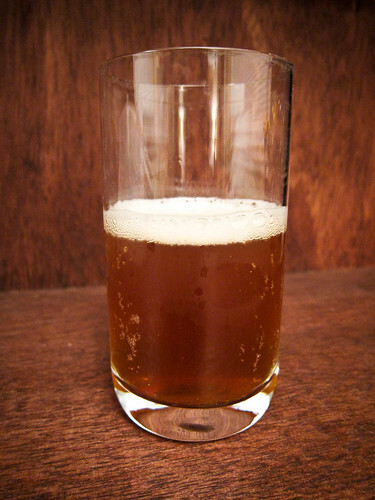 Justin Way American Pale Ale is has a light brown color and a slight foam head. It goes down easy, paring well with somewhat hearty food. And the hops – oooh, the hops. I’m not crazy for really hoped up beers, but Justin Way has a really nice balance. Just enough of a hop taste that mellows out after a few seconds. 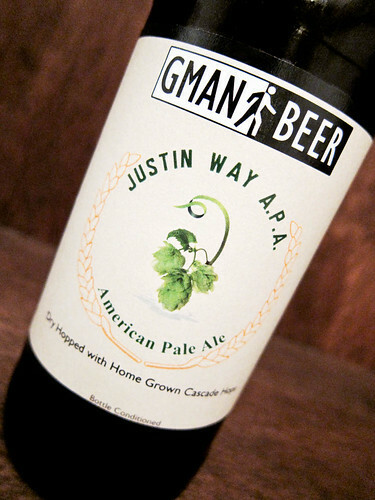 Unfornuatly for you, almost all the Justin Way APA is gone, but maybe you can snag a bottle next year. Just Way or whatever street we’re on… And be sure to check out Matt’s guest posts about home brewing beer.